Philip Henrici opened his first lunchroom counter in 1868 on a corner in the block where the Macy's/Marshall Field's is now. In 1893, he opened a new restaurant at this location, 67-71 W. Randolph, which stayed open until 1962, when the city condemned the property to build the Civic Center building (later renamed the Daley Center, pictured above). During the Spring of 1914, however, Henrici's was at the center of a labor maelstrom in one of the city's first female-organized strikes. Philip Henrici was Austrian by birth, but ran away as a boy to New York in 1845, finding work as a baker's apprentice. In 1868, he arrived in Chicago and opened his own lunch counter. His Viennese-style pastries were an immediate hit, and he made good use of his European baking skill when he opened his first Henrici's restaurant on Randolph street during the city's international-themed Columbian Exposition in 1893. The restaurant, decorated in the style of a Viennese coffee house, had stained glass windows and a pastry counter in the window to attract passers-by. Over time, despite (or possibly because of) its proletarian atmosphere, it became a hot spot for the city's political and celebrity class. 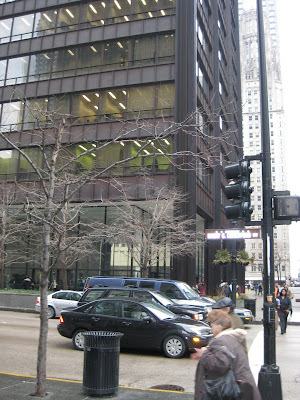 Mayor Richard J. Daley met with the power elite over breakfast there practically every day of his long administration. As Tribune society columnist Will Leonard wrote, Henrici's "was a resting place for the elbows of celebrities when the No. 1 booth at the Pump Room wasn't even a twinkle in an architect's eye." The advertisement below, from 1922, promotes an unusual feature of the restaurant much ignored among today's culinary critics: clean air (click to enlarge). Henrici's was famously cheap. The restaurant's original slogan was "All you can eat for a quarter." The original bill of fare (the word "menu" not then being in use in the U.S.) in 1868 offered sirloin steak (15c), veal cutlets (10c), three fried eggs (15c), hot cakes (5c), and apple pie (5c). Later, the restaurant became famous for the words scribbled at the bottom of the advertisement above: "No orchestral din" -- an indication that, unlike other restaurants that offered music to diners, Henrici's kept costs (and prices) at a bare minimum. It was a compromise divorce, [Henrici] said last night. At the time of the divorce he had charged her with drinking thirty-one highballs at a sitting. Mrs. Henrici the first said that would have been a physical impossibility, and that, anyway, whenever she drank, it was in company of her husband. She claimed that her desire to take up Hindoo philosophy was the real cause of the disagreement. Four days after the divorce, young Henrici remarried a Miss Frances Kavanagh. Under Illinois law, however, a man could be arrested for remarrying within a year of a divorce, and so the newlyweds hid out for a year before having a second formal ceremony to legitimize themselves before the state's archaic marital statues. Because of Henrici, Jr.'s flightiness, he never got far in his father's business, and control of the Henrici's on Randolph passed to a son of one of Philip Henrici, Sr.'s daughters, William M. Collins. It was Collins who owned the shop during the waitress strike of 1914. During the 1910s, women were exercising increasing political power in America, with most of their attention focused on suffrage issues, schooling reforms, and dry laws. But labor market regulations for female workers were not far down the list. In 1910, agitation to reduce the working hours of women began in earnest in Chicago, with attempts to regulate a maximum 10-hour day, and 6-day week. One strike in favor of lower hours at a diner in the financial district is described below; note the union president's silence -- verbally calling a walk-off could put one at risk of court suppression and injunction. A silence fell o'er that hungry group - broken only by the sound of someone eating soup. For through the doorway there had walked two women, who uttered not a sound. The first one raised her finger and calmly glanced around. Each diner paused with knife and fork poised, wondering and waiting. Who could the women be? What meant that index finger shaking? Each waitress promptly dropped her plates on tables or on the floor, and doffed her apron, donned her hat, and started for the door. The owner of that finger was their union president, its shaking was a signal, and "on strike" each waitress went. In 1911, the Illinois legislature passed a law limiting women's hours worked. One wonders, however, whether the real beneficiaries of the legislation weren't male workers, who were able to limit their labor market competition by force of government. Regardless, emboldened by the victory, advocates pushed for further concessions, higher wages, and fewer hours. February, 1914, saw a general strike against 35 major restaurants in the Loop district, demanding recognition of the waitresses' union, and closed-shop conditions. Henrici's was selected as the first and primary target. The sidewalk outside the restaurant was continuously picketed by women carrying signs and calling out to patrons not to enter. "I asked my employees if they wanted to join the union, but they are unwilling. Then the representatives of the unions asked me to sign an agreement which virtually would compel me to force by employees into the union or discharge them. The employees here are satisfied, and I don't want to do anything that would cause them to become dissatisfied." We were met by gunmen the first day the strike was started. They told us they would make footballs of us before we got through with the strike. The waitresses complained that the police cursed them and attempted to interfere with their picket line in front of Henrici's. They claimed police had dragged some women so violently that their shoulders were torn and bruised. In one case, the union president, a Miss Carrie Alexander, was arrested for disturbing the peace in front of Henrici's. When the police arrested her, they asked her to walk with them to jail. She refused, sitting down in the February sidewalk slush, to the cheers of a growing crowd. The police attempted to pick her up and carry her, at which point she began to kick and scream, and a crowd of 5,000 supporters began jeering for a riot. To avoid violence, Miss Alexander proceeded to jail, but after posting bond, returned to Henrici's, where she was arrested again twice that day. When they found out about the purported violence, Jane Addams and Ellen Gates Starr, founders of the famous Hull House, lent their support to the women, with Starr leading many of the protests, and union meetings taking place at Hull House. Eventually, however, legal appeals were exhausted, and the strikers ended their protests in June of 1914 with little to show for it. With the strikes over, Henrici's on Randolph continued developing into a Chicago institution, with several other locations opening in other parts of the city, as well as in St. Louis and other towns. In 1962, the Randolph St. location closed and was torn down to make way for the Civic Center, later named the Daley Center. Henrici's was later owned by the Pillsbury Corporation, which maintained the other retaurant locations until the early 1980s. The restaurant in the Ramada on Manheim in Rosemont was one of the last Henrici's to go. I want to thank you for you blog. It has solved a mystery that I have been researching for 10 years. Ten years ago I bought two old albumen prints of a man in a buggy being handed an envelope. There is a tall & large man that is wearing a top hat & tails as a small group of onlookers watch. He is holding the end of an envelope as he hands it to a man sitting in his buggy in business work clothes. A few of the onlookers are wearing ethnic type cap, something like the Greek hat but different. Also couple of men are wearing top hats (stove type) in the group that seems to be part of the ceremonies. In the photo there was a name on a building behind them that eluded me for years, for it was difficult to make out. I thought the name was Col "Wadsky" Museum. On and off for then years I put in combination of the name with no luck. I was talking to a friend about it and had him look at it. Immediately he says it looks like Col Woods Museum on the building. When I entered that name I get hits, but more important a oil painting showing the exact building and the surrounding buildings. This also led me to your blog yesterday. Eureka, I had finally solved the location, Chicago, pre 1871. We know this because that building burned down in the Great Chicago fire. Someday I hope to solve the reason for the occasion. Then there was the mystery of the other photo. I showed the same man that was receiving the envelope in the other photo sitting in the same buggy (there is a bend in the metal dirt wall) of his buggy but at a different time. In this one he is dressed in top hat and tails and he sits in his buggy as a small crowd looks on. From the sign on the building and the building being on a corner has led me to believe because of your blog that this is Henrici first lunch counter. The group is standing in front of a corner store that has a sign, "Hot Coffee, Bread & Pies" that I think it is safe to say this was Henrici first store. It is obvious that it was being run on a shoe string. Thank you so much. Thanks so much for your blog, it is very informative. Phillip Henrici, Sr. married Annie S. Muhlke on 10/16/1873. Phillip Henrici, Jr. was born 8/3/1874. William M. Collins was born 8/25/1877 and thus could not have been "a son of one of Phillip Henrici, Sr.'s daughters". He was the son of William M. Collins, Sr. (born abt. 1838 in Ireland, died 1/22/1880 in Chicago where he was a saloon keeper and liquor dealer) and Ellen F. (Nellie) McGuire (born 1/15/1850 in Niagara, Ontario, Canada, died 12/3/1925 in Chicago). Nellie was my great-grandfather's cousin. William M. Collins, Sr. was a business partner of her oldest brother, William A. McGuire. Further research has revealed that William Murphy Collins (1877 - 1946) married Anna Theresa Henrici, daughter of Phillip Henrici, Sr. and Anna Muhlke, on 12/11/1902 in Chicago. They had three children: Virginia Louise (1903), William Murphy, Jr. (1905) and Kathryn (1912).